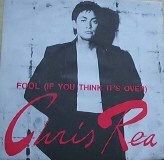 Over the years he’s been called the reluctant pop star although Chris Rea has never really considered himself a star. His career has bubbled along quite nicely for over 35 years since his first hit in 1978, but it took him 11 years and a song about London’s orbital motorway, the M25, to really enter into the public conscience. Chris, who is arguably Middlesbrough’s most famous export, was born in 1951 to an Irish mother and an Italian father. His father owned his own chain of ice-cream cafe’s called Rea’s where Chris worked after leaving school. He grew up listening to the blues and was inspired by people like Muddy Waters, Blind Willie Johnson and Sonny Boy Williamson and taught himself guitar. He also began to write songs and in 1973 joined a local band called Magdelene where he ended up at the lead singer purely because at a booked rehearsal the lead singer never turned up. In 1975 he left and formed a new band called The Beautiful Losers that were held in high esteem by Melody Maker who awarded them a Best Newcomers award, but Chris also managed to sign a solo deal with Magnet records where he was teamed with David Bowie and Elton John’s former producer Gus Dudgeon. In 1978 he released his first single Fool (If you Think It’s Over) which was intended as a blues song and written about his little sister who just had her first big blowout. “It never turned out the way I intended it to be,” Chris confessed, “I’d always seen it as a Memphis song and the trouble with it was that it was made a hit record so quickly I never had the chance to voice my opinion about what I thought about the production and it still would have been a hit because it was hit song material but I’d always heard it as a Memphis tune.” It never charted on its initial release but following its American success where it reached number 12, Magnet re-issued it here but it stalled at number 30. The parent album was called Whatever Happened to Benny Santini? Not a real person, but a touch-in-cheek stage name that Chris invented for himself and his record label tried to insist he used. Fool (If You Think It’s Over) was nominated for a Song of the Year Grammy but lost out to Billy Joel’s Just the Way You Are. A cover version by Elkie Brooks made number 17 in 1982 and it was her version that was first played on Radio Caroline when it was re-launched in August 1983. Another cover by the Geordie singer Kenny Craddock was used as the theme tune for mid-90s BBC sitcom Joking Apart. Chris went on to have 31 UK hit singles so far but the only one to make the top 10 is 1989’s The Road to Hell (Part 2). He has also solely written every one of his own hits, more than any solo male singer. He has been married to Joan whom he met when they were both 16 years old and has two daughters, Josephine and Julia of which he wrote a song about each, the former in 1985, two years after she was born and the latter in 1993, four years after she was born.